Makaela Marie, Isaac Timothy, and Jacquelin Cecilia: First real hair cut! 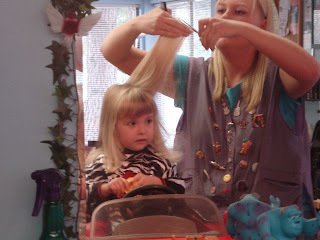 In preparation for the wedding, I took the kids to "Castle Cuts" to get Makaela's bangs straightened and to get a trim. This is the place to go to get your kids hair cut. Half of the entire place is kids toys for the kids who are waiting to occupy themselves with. It's great. Here Makaela sits in a sports car and gets her hair cut. She seemed a little worried, but overall, did very well.